The draws for the 2014-15 NLD U13-19 Competitions have now been finalised and are available to download below. Teams entered into the competition should also read through the NLD U13-19 Competition Rules. With the 2014 Glasgow Commonwealth Games fast approaching England Rugby TV caught up with the England Sevens Strength & Conditioning Coach Dan Howells during a Sprint Training Session. Check out the video below for an insight into the session and to hear Dan’s thoughts. With the 2014-15 season fast approaching the NLD Women & Girls Committee are looking to invite applications from Girls who are interested in being involved with the NLD Squads for the 2014-15 season. Open to girls in the U15 and U18 age groups the trials will be held on 14th and 21st September 2014. Alongside the U15 & U18 Trials and Training sessions there will also be development sessions for Girls in the U13 age grade which will be open to all eligible players. Please complete your application form and take along with you to the first trial in September. All girls in the eligible age groups are welcome to apply and we hope to see as many of you as possible at training in September. If in the meantime you have any queries please don’t hesitate to get in touch with Neil Speechley – [email protected] / 07948 094887. The Draw for the 2014-15 Derbyshire Senior Competitions has now been completed. There will be a Play it Safe course held at East Retford RFC on Wednesday 10th September, 7pm – 10pm. This course is for any volunteer or coach at a club who is working with or has responsibility for children and vulnerable adults within rugby. Places on the course are £15 and are on a first come first served basis so book now to ensure you don’t miss out. Booking is available online via the link below to the RFU Online Course Booking Centre. Please note that the system will be unavailable from 18th July – 31st July and therefore you will be unable to make bookings during this time. Newark U16’s successfully defended their NLD Sevens title at Sleaford RFC on Sunday 23rd March. The side, who were decked out in some colourful kit and orange headbands were certainly noticeable as they conceded no points in all four of their comfortable pool match victories. Coming up against old rivals Corsairs in the Semi Final meant that they had to dig deep but a 26-12 win was good enough to book their place in the final. The final was a meeting with Derby A who were not strong enough for the side of the day and Newark prevailed in a convincing 17-5 win. In the Plate final Market Rasen took on Paviors, sides that had come through respective Semi Finals against Scunthorpe and Keyworth strongly. On the day it was Market Rasen who came out on top, beating the Nottinghamshire club by a comfortable 31 points to 5. In the Shield Competition Boston who had entered their first NLD Sevens Tournament took the spoils with a strong 34-0 win over Mansfield Blues. The second Mansfield team however ensured that some silverware would be making its way back to Eakring Road with a convincing win over Kesteven A in the Bowl Final. The last trophy of the day was awarded in the Rugby Man Final as local team Lincoln took on Chesterfield Panthers. It had been a hard fought day at the office for both sides but it was the Derbyshire team who took the trophy home, beating Lincoln 17 points to 0. It was a day with some mixed weather conditions although certainly warmer than 12 months ago! Congratulations to all of the teams who took part and best of luck to those who continue on in the NLD U16 Competition. There will be a Play it Safe course held at Buxton RFC on Wednesday 3rd September, 7pm – 10pm. This course is for any volunteer or coach at a club who is working with or has responsibility for children and vulnerable adults within rugby. 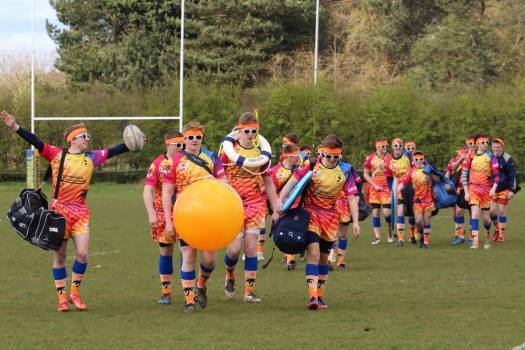 Nottingham Touch was established in February 2012 with the main aim of providing a club that is open to all. Whether you simply want to play social Touch locally, represent the club in domestic tournaments, or develop your skills further to gain regional or national representation, then we believe Nottingham Touch is the club for you. Most members of the club play in Perfect Motion organised adult Touch leagues throughout the year, as well as attend regular squad training and social Touch sessions each week. Several members of the club also represent the Midlands region and we have five current England players and two Wales players. The club has two representative sides in the Challenge Touch Series of national tournaments. Finally, if it’s a club social environment you are after, we regularly hold social events and encourage nights out whenever we can! 4 x NLD U16’s Into Midlands Training Squad! Congratulations to the four NLD players listed below who have been invited to attend the Midlands Divisional Training Weekend at Leicester Grammar on 25th & 26th January. Jordon & Ryan Olowofela have been invited into the Northern Division. We wish all of the players the best of luck in the next stage of selection.